Journey into outer space with Novomatic’s Twisted Pays online slot game. This slot is totally out of this world! When you load up this slot, immediately you’ll be flung out of the atmosphere and into orbit and around you, you’ll see planets, asteroids, stars and moons. It’s not just the background that’s out of this world, either, the symbols, features and the wins are too! From free spins to magnetised reels, this slot has it all. This slot is better-suited to more well-seasoned slots players who enjoy a game that’s not just 3 reels and 5 boring paylines! Players who enjoy spinning the reels on other Novomatic slots like Book of Ra Deluxe, Mermaid’s Pearl Deluxe and Dolphin’s Peal Deluxe will definitely enjoy Twisted Pays slot game and all that it has to offer. 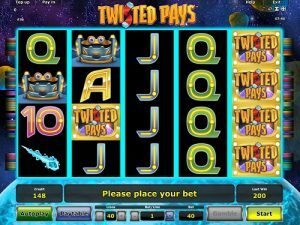 Twisted Pays is a slot game that’s all about all things space-related so it won’t be any surprise that the symbols look as though they’ve come from outer space. Lower-paying symbols include card values as is quite often for many online slots, and these card values are designed in a space-age font! The values are: 10, Jack, Queen, King and Ace. The higher-paying symbols are more intricate and complex in design and these are, in ascending order of value: the asteroid, the space telescope, the spaceship, the grey and orange alien and the green alien. These symbols cover Twisted Pay’s 5 reels and to get yourself a payout, you’ll need to spin three or more matching symbols on one of Twisted Pay’s 40 paylines and the identical symbols will need to fall on neighbouring reels from the leftmost reel towards the right. The paytable will display payout amounts according to current bet, so you can check that for exact payout amounts after you’ve selected your bet amount. The bet can be adjusted using the buttons at the bottom of the screen to either increase or decrease number of active paylines and bets per line. This space-themed slot is packed full of extra-terrestrial features that will blow your mind into outer space! The Twisted Pays symbol is the Wild symbol and this means it can substitute for any other symbol, except the Bonus symbol and the Magnet symbol. The Magnet symbol is what gives you the twisted pays as every single time this Magnet symbol falls on the reels, a spaceship driven by an ugly orange alien will appear and will fly over the reels, twisting and moving the symbols as it goes, to give you extra chances at getting those winning combinations of matching symbols! Each Magnet symbol triggers this feature once and it doesn’t cost you anything but could win you loads! The Bonus symbol is also extra special and should be sought after by all Twisted Pays players. This Bonus symbol can appear anywhere reels 1, 3 and 5. When you spin three or more of these Bonus symbols, you’ll trigger 15 free spins! During the free spins, the reels will spin without costing you your bet and they’re a great chance to stack up some extra big wins! Aside from all of these extra cool, space-age features in Twisted Pays that are simply out of this world, there are also some feature which are much more down to earth and distinctly Novomatic. One of these features is the autoplay feature and you’ll find this on almost any Novomatic slot game. This feature, when enabled, spins the reels for you automatically and allows you to play the game totally hands-free! The gamble feature is also found on many a Novomatic game and in Twisted Pays the gamble feature is their card feature – when you gamble a win, you’ll need to guess the colour of the next card (either red or black) and if you guess correctly, you’ll double your win but if not, you’ll lose it!